PLEASE ADD the Heretics and Heresies audio file link! I’m dyin’ here! ALL of your audio titles, including your own brilliant original thoughts, have been such a comfort to me as I emerge from the fog of Christianity. I am straight off to buy your hard copy book because I love the audio file of the same title. I have been lamenting how I would get my Luddite mother to hear your words. 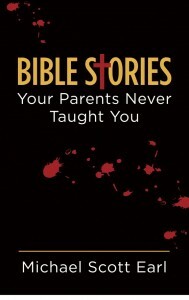 But she reads that Holy Babble every night, so I will give her your Bible Story book as a **gag** Christ**gag**mas gift. I hope I don’t spit up. I listened to Part 3A of this, and found it just awesome. One of the best collection of criticisms I’ve heard, really. However, I feel compelled to comment on the proposed etymology of the word “confusion” therein given (probably due in large part to my background in Linguistics, relevantly, here, in Historical Linguistics with a fair amount of focus on Indo-European languages). “Confusion” is actually far, far more likely to be “ultimately” constituted from (Latin) “con-” (“with, together with”) and “fundo, -ere” (“to flow”), which could be more literally translated as “flowing together,” “mixing up (as with liquids).” Of course, even in Latin, this word was used figuratively to refer to what we refer to as “confusion” (or something very similar, in any case), probably as a sort of mixing together of ideas in a way that turns resulting conclusions into nonsense. In any case, my apologies if that breaking up of the word in the recording was meant to be like that (for whatever purpose), and for posting a comment about it (I couldn’t find an e-mail address); I felt compelled because I really enjoyed the rest of the recording so much. It is generally awesome, and I look forward to listening to more. Keep up the great work! I do SOOOO hope the extinction of religion, as you so brilliantly describe, will kindly HURRY THE PHUCK UP. How much more LITERAL nonsense can THINKING humans endure? I have listened to your audios over, over AND OVER again until I am almost fluent in “Freethinker”. Your sense of humor coupled with the credibility of an ExChristian is a refreshing Voice in this Age of Hateful Atheism. Paine would be so proud. The part where you list the three things you would have young people not grow up without knowing has given me the final courage to “come out” to my Christian children as an agnostic leaning atheist. I owe it to them. My high schooler is working through all your audio files with great enthusiasm….the least I can offer him after eight years of forced Christian education…My youngest is the reason I saw the Truth and I will offer them to him when he is a tad older. I just couldn’t declare the veracity of a talking snake and a magic fruit tree and still expect that he would respect me for such a blatant lie. He is my thinker. And a little child shall lead them, indeed. My life has a new meaning as I spend Sundays on useful pursuits…like UNlearning the Bible (with your book, my old KJV and a highlighter), and probing the Christians in my sphere of influence. I have committed to gently and as you describe in an “affordable” way, demystify the mystical for the mind numbed faithful that surround me here in the Bible soaked South. I love your work and your thoughtful UNvangelism (is that even a word?). Please know that I am tearing through your book and plan to pass it on to my Southern Baptist mother, whom I know will never read it, but will be required, as a condition of haranguing me about my continued apostasy, to quote something of value from its cover from time to time. Hi Michael, Stan Levin here. and now I don’t see so good to read much anymore (I’ll turn 80 next month). I’m writing because I would hope you could send me an MP3 version so I could hear it on my Player as I try to walk at night. Any chance? Do you have any new books out?